Daniel House graded all of the Vikings draft picks and provided analysis of how the team is looking to structure their roster. After spending time evaluating tape and digging through all of the research, I will be providing analysis and grades of the Vikings 2015 draft picks. The team definitely drafted with a theme that reigns true with every selection they made. Each one of these players are very raw and athletic specimens. The coaching staff wants to take these unique skill-sets and develop the athletes into players that fit extremely well in the system. The Vikings added rookies that are impact players, which will provide more intrigue to how the roster is constructed in August. Trae Waynes- CB- Michigan State: The Vikings added Trae Waynes with their first round pick and spent little time trying to add more talent to the defense. I have continually expressed my openness to this selection since the team added him on draft night. Waynes has the intelligence level, along with the athleticism to be groomed into a top-tier cornerback. During rookie workouts, Mike Zimmer praised Waynes' ability to pick up information quickly and said his learning skills was some of the best he had seen in his coaching career. This is a huge compliment and is a statement that shouldn't be taken lightly. Mike Zimmer knows cornerbacks and if he can develop the footwork and technique that Waynes possesses, the Vikings will have a dynamic duo at cornerback. Waynes has the length and experience playing man coverage, which fits the philosophy of cornerbacks on this team. Pair him with Xavier Rhodes on the outside and the Vikings defense is heading in a dominant direction. Eric Kendricks- LB- UCLA: It didn't seem likely that Eric Kendricks would fall to the Vikings second round selection. Injury concerns caused him to tumble, but he has assured everyone that there are no problems. Kendricks has an extremely high intelligence level and his ability to be instinctive was some of the best among this class. The thing I like most about Kendricks is his ability to cover running backs and tight ends. He covers them well, but has the instincts to recognize when the ball is being handed off to the running back. His athleticism is very impressive and he can get sideline to sideline in a hurry. Mike Zimmer indicated he would be playing Mike linebacker, but I wouldn't close the door to the thought of him playing Will. The idea of having Anthony Barr and Kendricks on the field in the nickel package causes many to salivate. I don't think people give enough thought to how Barr, Kendricks, and Gerald Hodges would fit together on the field. The Vikings have options at the linebacker position, which is more than could be said last year. Danielle Hunter- DE- LSU: Danielle Hunter has such a high ceiling and it could be interesting to see how he is coached by the Vikings staff. His combine workouts were off the charts and the Vikings had a private workout with him at LSU. At 6'5" 252 pounds, Hunter still managed to broad jump 10-10 and corralled a vertical jump of 36.5 inches. These types of measurables are very impressive for a defensive end entering the NFL. He only played two years of high school football and just three years at the college level. If he can learn to use his physical advantages to rush the passer, he has potential to be rush the quarterback on a consistent basis. If he accepts the coaching and uses his motor and physical skills, he has the potential be a productive asset to Mike Zimmer's defense. 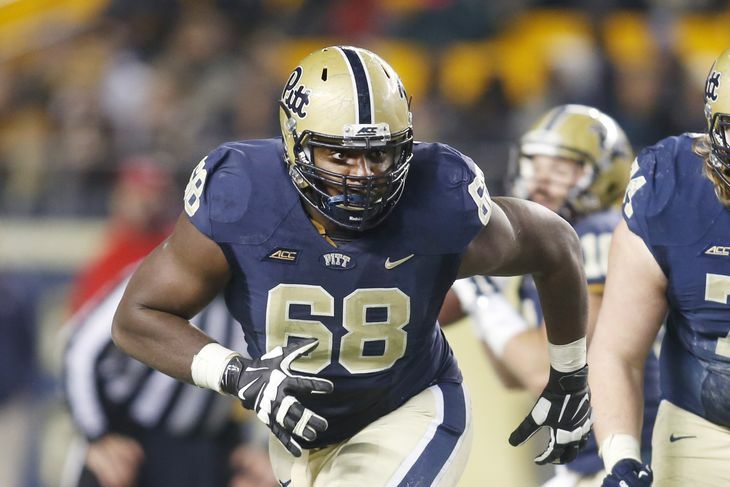 T.J. Clemmings- OT- Pittsburgh: As the draft approached, foot concerns caused T.J. Clemmings to fall down boards. At one point, he was considered a first round talent and after front office personnel were cautioned, he plummeted to the 110th overall selection. The Vikings medical staff felt this injury was not major and everything should check out well for the future. Clemmings was a value pick for the Vikings, but also filled a need at the tackle position. He didn't play offense until his final two seasons at Pittsburgh and converted from a defensive lineman to an offensive tackle. His physical traits allow him to mold into a high caliber offensive lineman at the next level. However, he is very raw and needs to improve his pass protection techniques. The coaching staff isn't ruling out the thought of him playing left guard this season, but this seems unlikely. He needs coaching and more experience, but a high character player with the talent level he can provide, was the perfect fit for the Vikings organization. Give him a year or two to work in the system and he has the chance to be something very special for many seasons to come. MyCole Pruitt- TE- Southern Illinois: MyCole Pruitt was a very surprising pick in the fifth round, but when you think of how he could be used in the offense, the selection makes more sense. He is a very athletic player that could play H-back, fullback, tight end, and he could even spend some time flexed out in the slot. His production levels were off the charts at Southern Illinois, but he hasn't seen much top-tier competition at this point. Nonetheless, his skill-set transfers very well to the next level. He is a versatile player that has very good length and playmaking abilities. After watching multiple games on tape, I was most impressed with his soft hands in the passing game and his ability to be very aggressive. He mainly needs work on keeping his motor rolling through the whistle and engaging as a blocker. Pruitt's ability to run block might be one of the keys for him landing among a tight end group that features Kyle Rudolph, Chase Ford, and Rhett Ellison. He could play multiple positions and the more he can provide on the offensive side of the ball will increase his value. Stefon Diggs- WR- Maryland: I spent time watching Big Ten football on a consistent basis last fall. When watching Maryland, wide receiver Stefon Diggs flashed as an extremely athletic playmaker. He has the size and experience playing on the outside, in the slot, and as a kick returner. Diggs is a player that can make a distinct impact when he is warranted opportunities. I don't see him having the strength to play much on the outside at the next level. The vast majority of his snaps will come in the slot on third down when the Vikings are trying to move the chains. Diggs has experience playing special teams and flashed as a return specialist. Once again, the more contributions you can make, the more value you can possess on an NFL roster. Diggs didn't play his best as a senior and missed time with a lacerated kidney. However, he performed well during his time on the field and I was particularly impressed with ability to make tacklers miss in the second level. Diggs will make the wide receiver battle even more interesting and could provide a contest for the sixth or seventh wide receiver spot on the 53-man roster. Tyrus Thompson- OT- Oklahoma: Tyrus Thompson can play multiple positions for the Vikings and fills the 'swing' tackle mold. Thompson particularly played left tackle at Oklahoma and his length and size were the attributes I found most interesting in his game. The main issue I could find with Thompson was an inconsistency in his effort. When he was getting his motor moving, he was finding defensive players in the second level and was making an immediate impact. I liked his pass protection protection abilities, but was particularly impressed with his run blocking. However, as I said earlier, he lacks consistency in both of those areas. He is another player that has upside and athletic prowess, but needs coaching. With technique work and familiarity in a scheme, Thompson could be developed into a serviceable rotational offensive lineman. B.J. Dubose- DT- Louisville: B.J. Dubose could play some defensive end or three technique in the middle at the next level. His combine workout was most infamous for his fall and hamstring pull during the 40-yard dash time. Dubose won't blow anyone away with his athleticism, but his lower body strength has defensive end written all over it. However, I don't believe he can handle playing much on the edge in the NFL. I see him being used as a nickel rusher in third down situations. He may not have bundles full of talent, but his effort is off the charts. He is a player that can win on the field by being more fundamentally solid than the player in front of him. Austin Shepherd- OT/OG- Alabama: I was surprised that Austin Shepherd was still available in the seventh round for the Vikings. He is an extremely aggressive player who plays with an edge on film. He played right tackle at Alabama, but Rick Spielman indicated he would play guard for the Vikings. He has position flexibility and was very well coached in technique and fundamentals while playing at Alabama in the SEC conference. I was most impressed with his instincts as a lineman and liked what I saw when it comes to blocking and pass protection. He will be a player that needs to work harder than anyone else to be successful at the next level. Shepherd will be a rotational backup that can fill a void when injuries plague the offensive line. Edmond Robinson- LB- Newberry: Edmond Robinson has phenomenal length (6'3" 245 pounds) for an outside linebacker and is an intriguing prospect. He can get sideline to sideline very well and has proven himself in space. He didn't play against elite competition and you have to wonder if he can handle the learning curve at the next level. Robinson is a very raw player that could be coached into someone who could take the league by surprise. It was worth taking a flyer on him in the seventh round to see if Mike Zimmer can mold him into a ball player. Overall Minnesota Vikings Draft Grade: A-: The Vikings drafted for extreme value and all of the picks made sense for drafting BPA and filling need at the same time. The main worry with this draft class will be whether they can be coached to garner all of the athleticism. There is no reason to believe this won't happen and it is scary to think of how much this draft class could help take the Vikings roster to the next level.